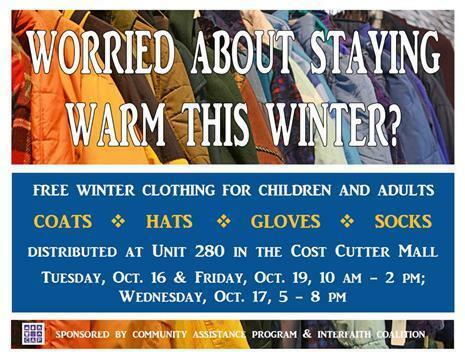 The Community Assistance Program (CAP) will be holding its Winter Coat Distribution in October. This program includes more than just coats. Hats, gloves, and socks will also be available. Thanks to generous donations from our community, families in need are encouraged to come and get ready for winter temperatures. There are two dates for daytime distribution (Oct. 16 & 19 from 10am-2pm) and one evening (Oct. 17, 5pm-8pm). Come get warm for the upcoming cold weather!